There are many lubricant products that all claim to do different things, or do they? So it is easy to see why this can become confusing. Not to mention there are even more lubrication products becoming available on the market every day. 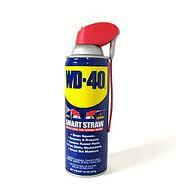 I have been on many boats and usually see mixture of WD-40 and some sort of dry lubricant or silicone spray. Rarely, do I see grease of any kind unless it is for some sort of engine related use. Today I would like to talk about what lubricants pertain to your boat’s rigging, what you need to keep on board, and what can stay a-shore. 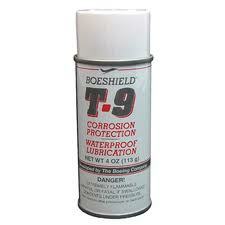 Spray Lubricants; Aero Kroil, Liquid Wrench, T-9 Boeshield or PB Blaster are exceptionally good penetrants. They can come in very handy if you need to lubricate in-between tight places like the threads of a seized screw for instance. These types of lubricants can typically be left at home. Usually you only need break screws free if you a working on something that has severely lacked maintenance, which is usually part of a bigger project like a mast and rigging refurbishment. Although it says on the can that WD-40 is a penetrant, it wouldn’t be my first choice for achieving lubrication or penetration over the aforementioned products. That is not say that WD-40 isn’t a GREAT product. It can definitely come in handy in various marine applications. Our shop will generally use WD-40 to clean, de-grease, and dissipate moisture. Namely in servicing a boats winches (you can read more on that here). It can also be used to remove/ clean up any excess sealant. Although you should have a can of this with your winch service kit, Wd-40 can typically be left a-shore for the average club and buoy racer. Most people overuse these products and one should practice restraint when resorting to these spray lubricants. Most of these lubricants are petroleum based and leave an oily finish which can collect dirt and dust. T-9, however, from the Boeing Corporation is a special type of spray lubricant that when dry will leave a waxy finish, thus attracting less dirt then these other lubricants. Originally developed for the aircraft industry, T-9 can come in handy in tight to reach places that would typically require Teflon grease or the like. Some of the applications that are ideal for Boeshield are plunger pins in aluminum spinnaker pole ends, aluminum blocks with metal bearings, or aluminum sheaves with stainless steel sheave pins that cannot be easily accessed. Dry Lubricants; I would try and stay away from silicone spray all together. Yes, this does leave a slick finish but it also leaves behind a pretty thick film of non-marine grade silicone that is not easily removed and moreover is not designed for marine use. Non-marine silicone can cause mildew and certain plastics/rubbers to disintegrate or have a shortened life expectancy. 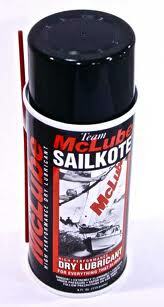 When talking about dry lubrication on a boat the best choice is Team Mclube’s SailKote. Now just like anything else this is a wonderful product when used in the proper application. SailKote is to be used in just about every type of ‘sliding’ application imaginable, i.e. non ball bearing; sail tracks, jib lead tracks and even traveler tracks. Please note it is NOT to be used in ball bearing applications, only where the hardware ‘slides’ across or through a track. Mclube’s Sailkote should always be on-board of any sailing vessel at all times. Oils and Conditioners; The famous household 3 in 1 oil actually should have a home aboard a boat, and that home should be with the winch service supplies. This is a ‘one drop’ll do ya’ type of product and is mainly recommended for use on winch pawls and springs. For the club racer or the day sailor, this can stay in the garage. 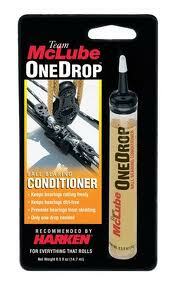 Team Mclube also has a new product for anything with composite ball bearings, it is called OneDrop conditionaler. So this would be for any plastic, Torlon, non-metal ball bearing piece of hardware on your boat, i.e. Harken furler’s, Schaefer Furlers, Harken Batt Cars, and much more. This product can probably be kept at home as well, for I cannot think of one emergency that one might encounter where soap, water or any of the other above mentioned lubricants couldn’t handle the job, at least temporarily. I want to just take a second to touch on the hydraulic oil subject, as I am asked about it regularly. Of course the best bet in this case is to see your local rigger. Just keep this in mind: Hydraulic oils vary based on the boats geographical location and use. Usually it will need to be a low viscosity grade that stands up to relatively high temperatures. It also needs to be free of all detergents, which could cause gases to expand within the cylinders and cause seals to become compromised. Finally, Grease; There a lot of greases, Furlex grease, Harken grease, Lanocote, Super Lube and the New Marelube just to name a few. Super Lube is an automotive product that I stand behind 100%, and is totally acceptable for marine applications. You can use it almost any where requiring grease. 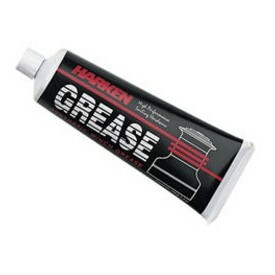 All of these various grease manufacturers, in my opinion, provide a very similar product. Harken and Furlex grease come in a handy applicator, which is why I like them, because it makes less of a mess based on the required application. Lanocote has unfortunately been surpassed (again, in my opinion) by these other synthetic/Teflon based lubricants. Mainly because Lanocote is very temperature sensitive and because it is based on lanolin which makes it not smell good and it can become rancid after a while. Marlube is Forespar’s (makers of Lanocote) newest lubricant that provides all of the latest and greatest in lubrication technology. To me, it is simply the official marine industry’s Super Lube. All of these lubricants can be adequately used on any furling gears, metal ball bearings, turnbuckle threads or any hardware requiring a little grease. If needed T-9 can be used temporarily in place of these previously mentioned spray lubricants, even WD-40, but I wouldn’t use the other lubricants in place of T-9. So if it were my boat, I would keep 1 tube of Harken gear grease, 1 big can off SailKote, 1 can of T-9 Boeshield, and a full roll of heavy duty paper towels on board as a minimum. 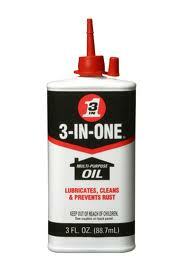 These three products should remedy any and all of your lubricating needs aboard your boat (rigging wise). I hope this helps you choose the right lubricant the next time you are in your local chandlery. If you have a question that you would like to ask us, just leave us a comment and we will get back to you. Trying to get our spinnaker to fully come out of spinnaker sock. Was told to put a lubricant on top of spinnaker sail. Do u know what name of this lubricant is? Thanks so much. I am not sure on that one, but I would try a sailmaker like Chesapeake Sailmakers. I am sure they’d know and would love to help. Hi, I have recently bought a 27 foot sailing boat and am going through a sharp learning curve on maintenance. Can you please advise what lubricant(s) I need for cleats, pulleys, clutches and winches? Thanks for checking us out, to answer your questions… Lubricants for cleats, none just soap and water. Pulleys (a.k.a. blocks), soap and water as well, no lubricants, but for ball bearing blocks you can use One Drop Conditioner from Team McLube after washing and rinsing. Winches will require winch grease or Super Lube. See our blog on <a href=”http://theriggingco.com/2014/09/08/how-to-service-your-winches/”>winch service</a> for more info. recently I have run across Lanolin based lubricant they are amazing, dont wash off wont hurt robber, paint etc, have you had a chance to try any of these. I have, we used to always use Lanocote, sometimes still do. It works great. My only qualm with it is, it is very temperature sensitive and can be become rancid after a while…and it stinks! Marelube or Superlube I like because they are synthetic teflon based products. They last a long time and remain temperature stable, but both are great for lubricating threads or to help avoid corrosion from dissimilar metals.